According to Forbes, We're in an explosive era of growth. Thanks to the birth of the internet and our newfound global connectivity, generating a real income online, no matter where you live or what you do, has become a modern-day convenience. Gone are the doldrums of 9-to-5 employment and the necessity to head into a life-sucking corporate job. Today, the so-called "dream" revolves around the lifestyle entrepreneur, able to make money, travel the world and live life to the fullest from anywhere on the planet. However, it isn't just about the digital nomad lifestyle that gets people so excited. More so than getting rich by any measure, the masses are merely attempting to wrap their minds around generating a respectable amount of cash, enough to satisfy their expenses and leave a little bit of disposable income at the end of the day. While many look to fulfill that desire, very few, in fact, are able to follow through. use any of his cash to do it. He simply replicated the same technique he utilized in the grocery industry, but instead, did it for the real estate industry. And the results were unfathomable, allowing him to generate millions of dollars, almost on demand, while also becoming one of the leading internet marketers in the world, building up a massive list. You see, Clothier didn't just apply what he knew to real estate, flipping contracts and houses for a significant profit, but he was also able to use his business and sales savvy to turn that information into a goldmine. He effectively created something out of nothing just by tapping into that hidden potential that's buried deep inside each of us. The truth of the matter is that very few ever tap into their hidden potential inside. They relent to bad habits and the status quo, never really thinking that they can achieve their biggest goals in life. They give up and throw in the towel, calling it quits. But it's virtually impossible to get rich if you give up. Failure is just a stepping stone. It isn't the end of the road. If you're serious about, not just making lots of money, but in creating significant wealth, here's a blueprint on how to do just that. It sounds a bit like a cliche, doesn't it? Just add value, and everything will be better. But how many people do you really think go out there into the world with the desire to add massive amounts of value? Clearly, many people are out there to do the least amount of work for the greatest return. That mindset is born from the id. It's instinctive, and hidden within the far reaches of our subconscious mind. Overcoming that is a hurdle, but a very necessary one to make. It's really easy to look at certain strategies and techniques in business or in life that will help you make monumental leaps forward, financially speaking. But that doesn't take into account one of the most important ingredients for success. If you're serious about succeeding at the highest level, be grateful. Not tomorrow. Not in a few weeks when you get a raise. Right now. In this very moment. Why? Because it could all disappear in an instant. Appreciate what you have while striving for more. 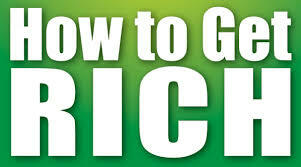 Getting wealthy or attaining a certain level of income is just like achieving any other goal. To get there, you need to ensure that you set those goals the right way. Set SMART goals and be very specific about them. Don't set them arbitrarily in your mind. Write them down and come up with powerful reasons why you absolutely must achieve them. That's one of the biggest and most potent internal transformations that you could make in your mind. When an airplane leaves from one city to the next, it has a plan. Its plan is called a flight plan. It's a massive action plan that involves speed, altitude, direction of travel and many other facets. But what happens when there's turbulence or air-traffic congestion or it needs to change course for some other reason? The plane changes its plan. But it doesn't change its goal of where it's going. Create and follow a plan, and don't be afraid to change it if you see something isn't working. We've all heard the saying. Pay yourself first. But how many people follow it? The truth is that most of the world lives with a scarcity mentality. They go paycheck to paycheck, petrified of what might occur if they get sick or lose their job or something else traumatic happens. The truth is that if you don't pay yourself first, you'll never be able to get rich. It's part of having an abundant mindset and should be prioritized at all costs. While it is possible to make a lot of money while working for someone else, the truth is that you should mind your own business. Start and grow your own business, no matter what it might be. Identify what you're really good at, and develop the skills into a business that you can expand over time. Don't look for instant payouts or overnight riches. The reality is that it's going to take time, so you might as well start now. The last step resides in the concept of contribution. Even if you have no money, find a way to contribute to others. Look for opportunities where you can help those around you. Whether they're in need or not, this mindset will drive home the point that you have more than you need, even if you physically don't. Search for ways, every single day, where you can contribute either your time or your money to those who might be less fortunate, because that's the true essence of success in every form.